California farmers now must abide by the nation's strictest rules for a widely used pesticide in a change designed to protect farmworkers and people who live and work near agricultural fields but is likely to raise prices on produce. 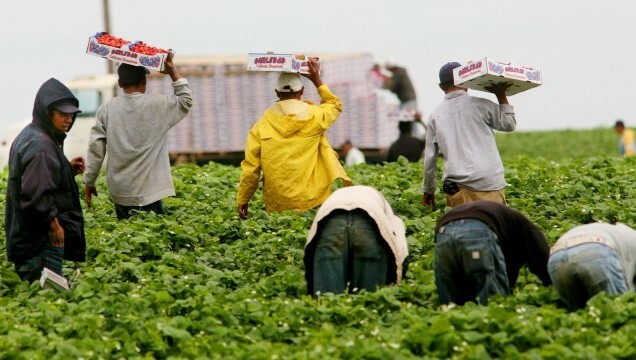 Brian Leahy, director of the California Department of Pesticide Regulation, said Tuesday that the higher standard is needed in California, the nation's leading agricultural producer and most populated state, where farms are often next to people. Costs are sure to rise for farmers, who will pass it along to consumers, but Leahy said it is worth it. "It is burdensome," Leahy said. "But if we're going to use these tools, we've got to ensure that they're used as safely as possible." Under the new regulation, farmers are limited to applying the pesticide on up to 40 acres in one day, a reduction of 75 percent. It also expands the distance between fields and human activity - in some cases to double the distance. Farmers who use upgraded tarps to cover their fields while applying the pesticide can follow less stringent regulations, said officials. California farmers fear that tighter restrictions will increase the costs of their fruits and vegetables, potentially driving the market out of state or the country. Almond and grape growers use chloropicrin once every 20 to 30 years when they plant a new orchard or vineyard, but California's strawberry growers, who use it each season, may be hit hardest. California produces 88 percent of the nation's strawberry crop, supporting a $2.3 billion industry, said Carolyn O'Donnell, a spokeswoman for the California Strawberry Commission. It will cost the state's strawberry growers an estimated $20 million to buy upgraded tarps to cover their crops and comply with the standards, she said. "Farmers and their families live near their farms and work in their fields and care deeply about protecting the safety of their workers, neighbors and communities," O'Donnell said.